The men’s basketball team will retire the No. 25 jersey to honor alumnus Alex Welsh. The ceremony will be on Feb. 8 after the women’s basketball game against MSU Denver. The men will then take on the MSU Roadrunners at 7:30 p.m. Right after the women’s game at 5:30 p.m., Welsh will have have his jersey retired and placed next to the jersey of his former teammate, Derrick White, who is currently a starting point guard for the San Antonio Spurs. White’s No. 14 jersey was retired in a ceremony about one year ago. In four years at UCCS, Welsh played in 117 career games, holding the scoring and rebounding records in program history. He received his business administration degree from UCCS in May 2016. Alex Welsh started 21 games as a freshman on the team, he finished third in the UCCS freshman records with 313 points and second with 153 rebounds. During Welsh’s second year at UCCS, the team was honored as the All-RMAC Second Team and the RMAC All-Tournament team. 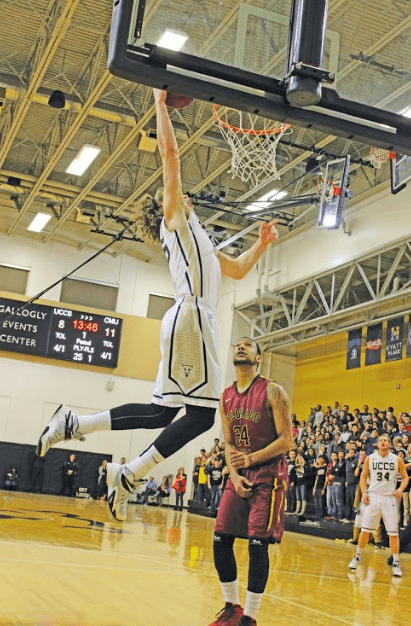 Welsh set two records for the UCCS sophomore class, scoring 409 points and winning 196 rebounds. His junior year, the team was placed all-RMAC first team. Welsh won eight rebounds in the championship game that year (2015), helping the Mountain Lions to win the first RMAC tournament championship in program history. In a game against Black Hills State, he scored 26 points, which brought him past 1,000 career points. During his senior year, Welsh accumulated a number of awards and honors, including Division II Bulletin All-American Honorable Mention, participation in the Reese’s Division II All-Star Game, and All-RMAC First Team for the second straight season. Welsh was able to set a program scoring record of 1,947 points and 884 rebounds. He helped his team in 2015 to win their first RMAC tournament Championship. “Alex is a great young man with an infection personality,” said Culver. “We was a joy to coach, and it has been great to keep in touch with him over the years. He is currently a realtor in Denver.” Welsh is also a member of the Denver Metro Association of Realtors.